Just in time for Halloween, this is the fourth in a series of interstitial mixes. I recently worked a gig to provide a 50 minute Halloween AV mix for a party. The audio version can be enjoyed in the feed. Go to the main site to see the audiovisual version. 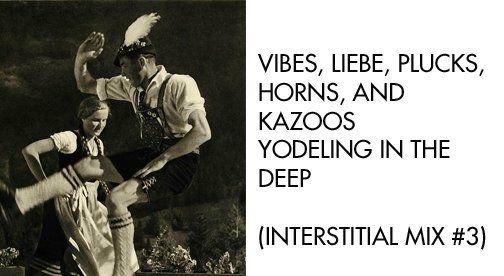 This is the third of a series of interstitial mixes, this one very heavy on Germanic influence (although featuring many others!) and designed with the changing seasons, both in year and in life, in mind. This is the second of a series of interstitial mixes, this time imagining a race between two very strange imaginary figures. This is the first of a series of interstitial mixes that will be rolled out as I continue to develop some future projects. What follows is a descent into the contradictions of pop music, initiated by one Robert Smith trapped in the framework of a famous Lionel Richie composition. While the mix is enjoyable on its own terms, there are many hidden associations for those wishing to play along. Interpretations of this madness are, of course, quite welcome in the comments. There are 2.4 million waiters and waitresses now working in America. Why have our narratives failed to confront the realities of working in a restaurant? Merritt Pierce, author of LOVE ME BACK, joins us to discuss working-class narratives, the male gaze, abortion, and women as second-class citizens. This show also includes a strong critique of 2 BROKE GIRLS and one of the most startling on-air gaffes in Bat Segundo’s history. This special two hour episode of The Bat Segundo Show details the life and work of Stefan Zweig in considerable detail. It may be the most epic radio program ever devoted to Stefan Zweig. It includes interviews with translator Anthea Bell and George Prochnik, author of THE IMPOSSIBLE EXILE.